Many studios understandably wait to distribute many of their most prestigious movies closer to the end-of-the-year holidays, in hopes of garnering attention for the major awards season after the beginning of the new year. But the summer season is also a noteworthy time for cinema fans, and summer 2019 is promising to be no different. The upcoming summer months promise to be the latest season set to release gripping, entertaining and memorable films. The summer 2010 movie season is set to begin early, as director Justin Kelly’s biopic, ‘J.T. Leroy’ will be distributed in theaters and on Digital and On Demand on April 26 by Universal Pictures Content Group. Kelly and Savannah Knoop co-wrote the script for the drama, which stars Kristen Stewart, Laura Dern, Jim Sturgess, Courtney Love and Diane Kruger. ‘J.T. Leroy’ follows the life of Knoop (who’s played by Stewart), as she spends six years pretending to be the celebrated title author and cult status character, who’s the made-up literary persona of her sister-in-law , Laura Albert (Dern). Photo courtesy of Universal Pictures Content Group. The season’s next exciting release is the action drama, ‘El Chicano,’ which was directed by Ben Hernandez Bray, and written by Ben Hernandez Bray and Joe Carnahan. Briarcliff Entertainment is set to release the film, which stars Raúl Castillo, Aimee Garcia, Jose Pablo Cantillo, David Castañeda, Marco Rodríguez, Sal Lopez, Marlene Forte, Kate Castillo and George Lopez, on May 3. ‘El Chicano’ follows L.A.P.D. Detective Diego Hernandez (Castillo) as he’s assigned a career-making case investigating a vicious cartel. But along the way, he uncovers links to his brother’s supposed suicide and a turf battle that’s about to swallow his neighborhood. Torn between playing by the book and seeking justice, he resurrects the title masked street legend. Now, out to take down his childhood buddy turned gang boss, he sets off a bloody war to defend his city and avenge his brother’s murder. For more information on ‘El Chicano’, visit its Facebook, Instagram and Twitter pages. Another intriguing movie that’s garnering attention through determined persuasion is the comedy, ‘The Hustle,’ which MGM will distribute in theaters on May 10. The film was directed by Chris Addison and written by Stanley Shapiro, Paul Henning, Dale Launer and Jac Schaeffer. Anne Hathaway and Rebel Wilson star as female scam artists, one high class and the other low rent, who team up to take down the dirty rotten men who have wronged them. For more information on ‘The Hustle,’ visit the comedy’s official website, as well as its Facebook, Instagram and Twitter pages. 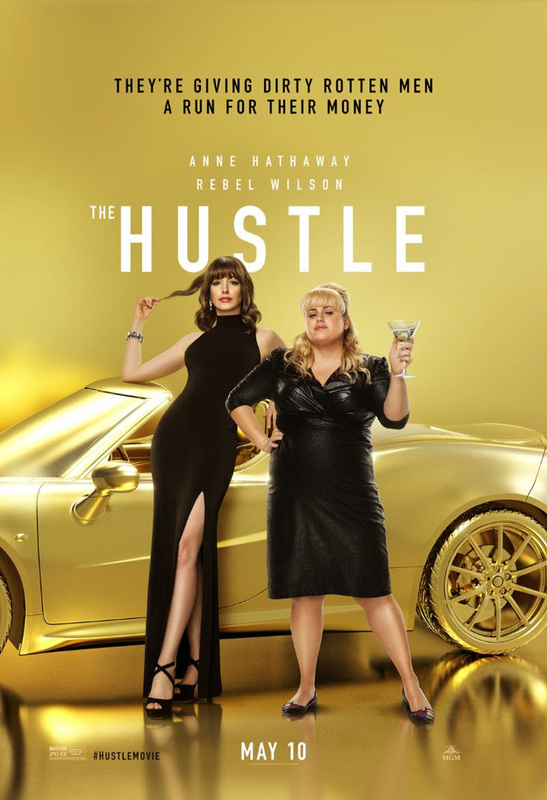 The poster for irected by: Chris Addison’s comedy, ‘The Hustle,’ which stars Anne Hathaway and Rebel Wilson.